Designing a simple and yet functional Line Follower Robot (LFR) is always a fascinating and challenging subject to be learned, the LFR actually could be implemented in many ways start from a simple two transistors to a sophisticated PID (Proportional, Integrate and Differential) which take advantage of the programmable feature of microcontroller to calculate the PID equation to successfully navigate the black track line on a white background surface. Designing a non microcontroller based LFR is quite challenging tasks as we need to limit the electronic components numbers so the LFR will not too complicated to be built by most average robotics beginners or electronic hobbyists, but at the same time we need to have a good speed control mechanism in order for the LFR to navigate the black track line successfully. 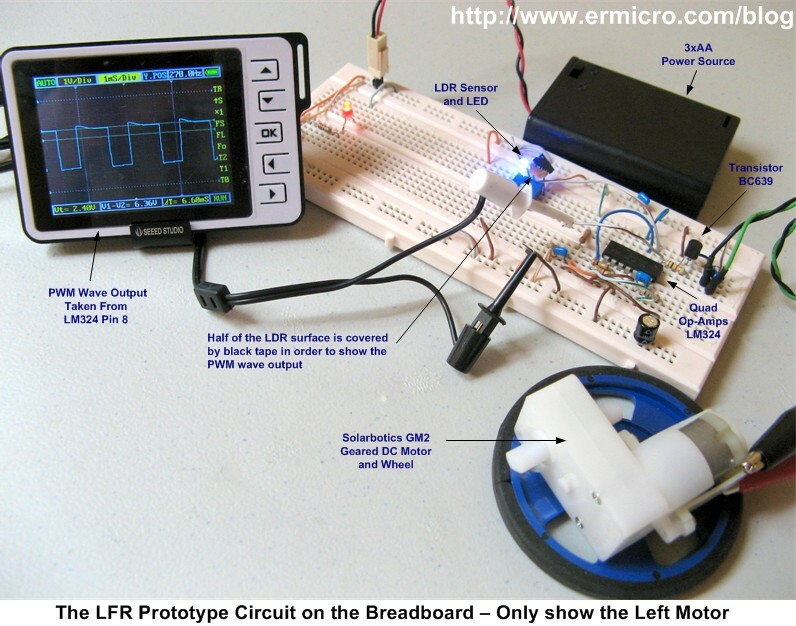 The microcontroller based design LFR in the other hand is a popular choice because it reduces a number of electronic components significantly while still providing a flexible programmable control to the LFR. 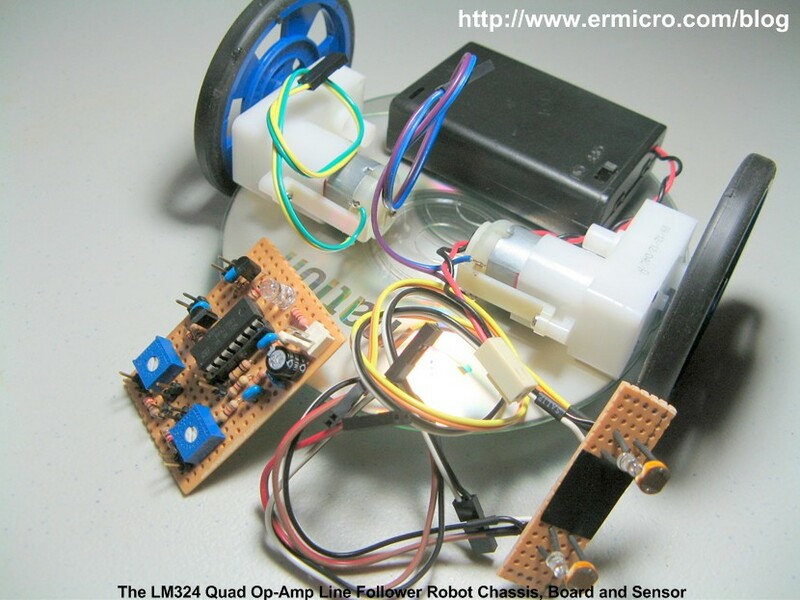 On this tutorial we are going to build yet another LFR using just the standard analog components easily found on the market but use the same speed control method technique found in many good microcontroller based Line Follower Robot design. 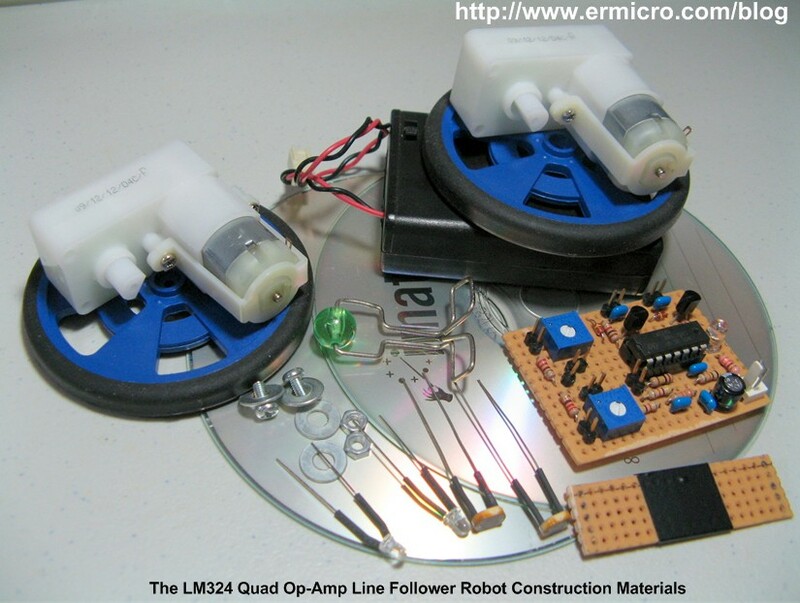 As the result we could get a good precision analog line follower robot that comparable to the microcontroller based Line Follower Robot design. On this tutorial you will also learn many useful information of how to use the operational amplifier. The easy method to navigate the black track line is to turn ON and OFF the left or the right DC motor according to the sensor reading (black turn OFF and white turn ON), but using this method will make the LFR to move in zigzag way. By proportionally control both left and right DC motor speed according to the light intensity level received by the photocell sensor (reflected back by the black track line) we could make the LFR easily navigate this track. The common technique to control the motor speed efficiently is to use a pulse signal known as the pulse width modulation or PWM for short. PWM basically is an ON and OFF pulse signal with a constant period or frequency. The proportion of pulse ON time to the pulse period is called a “duty cycle” and it expressed in percentage. For example if the proportion of pulse ON time is 50% to the total pulse period than we say that the PWM duty cycle is 50%. 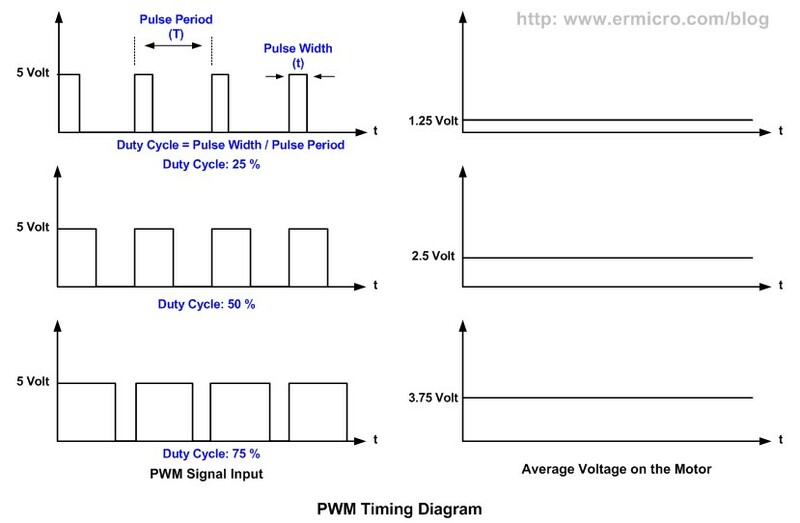 The PWM duty cycle percentage is corresponding to the average power produced by the pulse signal; the lower percentage produces less power than the higher percentage. Therefore by changing the PWM duty cycles we could change the average voltage across the DC motor terminals, this mean we could vary the DC motor speed just by changing the PWM duty cycle. Therefore to make the LFR smoothly navigate the black track line, we have to adjust the PWM duty cycle according to the photocell sensor reading. The brighter light intensity level received by sensor (sensor is on the white surface) will result in higher PWM duty cycle percentage and the darker light intensity level (sensor is on the black line) received by photocell sensor will result in lower PWM duty cycle percentage. By converting each of the photocell sensor light intensity level reading to the corresponding voltage level we could achieve this objective by using what is known as the Voltage Control Pulse Width Modulation principal. Actually generating the PWM signal is easier with microcontroller instead of discrete components because all you have to do is to program the microcontroller PWM peripheral to do the task. On this tutorial we will learn of how to build this LFR with Voltage Control PWM using the same working principal found in many today’s modern microcontroller but using just the analog electronic components. 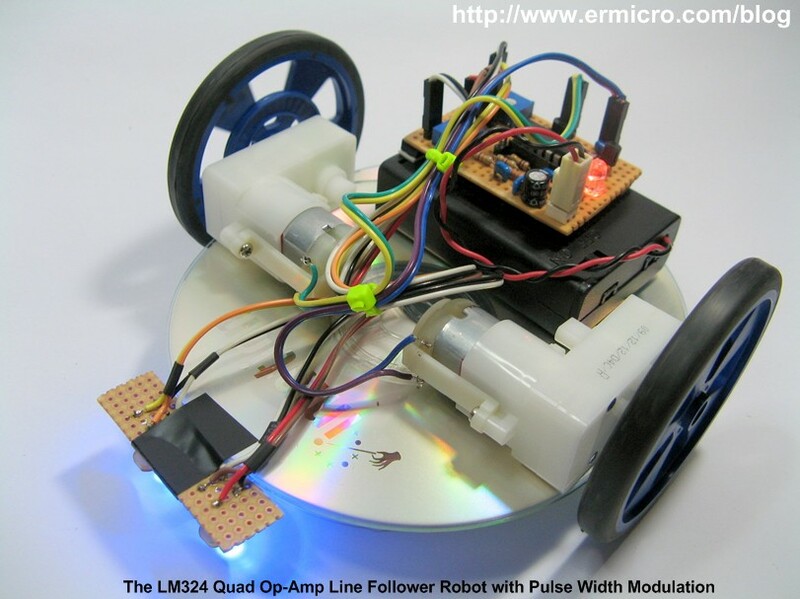 The main brain of this Line Follower Robot is lay behind the LM324 quad operational amplifier from National Semiconductor. The dual in line LM324 packages contains four identical op-amps and is specially designed to operate as an analog device. 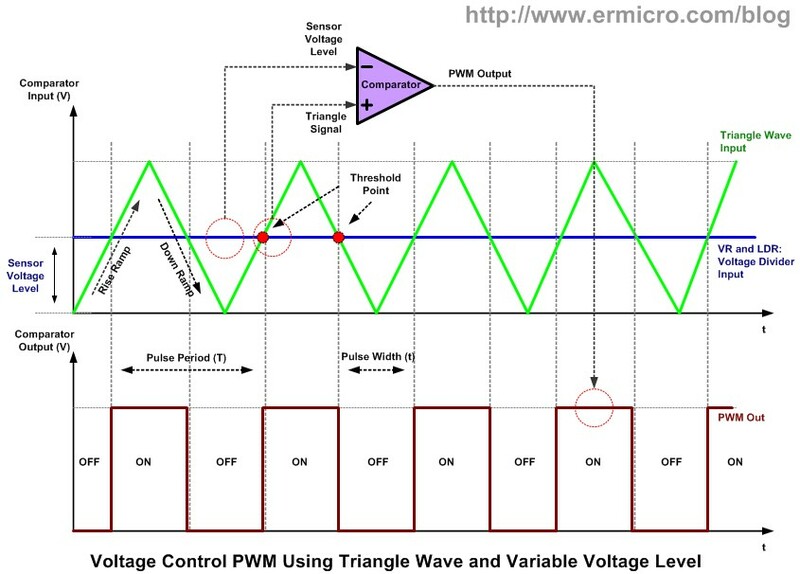 The voltage control PWM could be generated by first using the triangle signal generator which provide the basic PWM pulse frequency and the necessary ramp voltage (rise and down) to produce the PWM signal. Next by continuously comparing this ramp voltage according to the voltage level produced by the photocell sensor using the comparator circuit we could produced the exact voltage control PWM as shown on this following picture. When the triangle rise ramp signal reaches the voltage threshold point it will turn ON the comparator because the comparator non inverting input (V+) voltage is greater than the comparator inverting input (V-) voltage and when the down ramp signal reaches the voltage threshold point it will turn OFF the comparator because now the comparator inverting input (V-) voltage is greater than the comparator non inverting input (V+) voltage. You could read more about how the comparator works on Working with the Comparator Circuit in this blog. If we set the threshold point voltage higher, then the ON period will be shorten; and if we set the threshold point voltage lower, then the ON period will be longer. 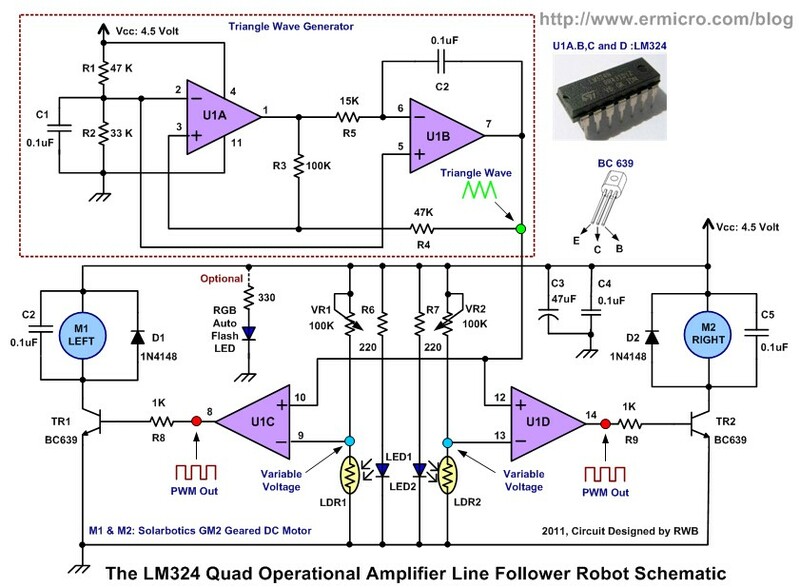 Therefore by varying the threshold point voltage we could also vary the ON and OFF period of the comparator which is the exact behavior that we are looking for to produce the required PWM signal to drive the Line Follower Robot geared DC motor. 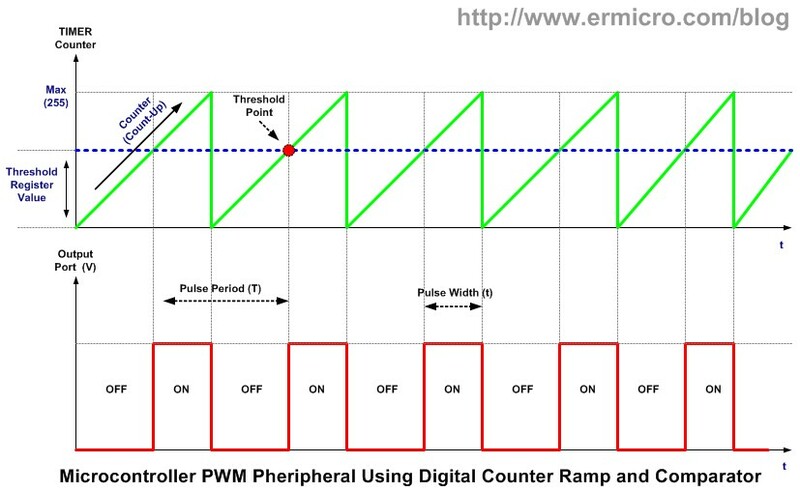 The PWM principal explained above is also used in many today’s modern microcontrollers PWM peripheral; but instead of processing the analog signal it process the digital signal. The ramp signal is replaced by the digital counter (TIMER peripheral) that will count up from 0 to 255 and start from 0 again, while the threshold point voltage is provided by threshold point register that hold the digital value (e.g. 100). Microcontroller uses the digital comparator to compare these two digital values, when the digital counter counting up and reach the threshold point (i.e. 100) then the PWM peripheral will turn on to the output port and when it reach the maximum value (i.e. 255) it will turn off to the output port. Therefore by changing the threshold point register value we could change the PWM duty cycle output. You could read more about microcontroller based PWM on H-Bridge Microchip PIC Microcontroller PWM Motor Controller and Introduction to AVR Microcontroller Pulse Width Modulation (PWM) articles on this blog. When designing the electronic circuit is a good habit to prototype it first, the prototype circuit enables us to fine tune the electronics design and give us the picture (signal wave) of how the circuit really works. The following picture is the Line Follower Robot circuit prototype on a breadboard complete with sensor (LED and LDR pairs) and the GM2 geared DC motor from Solarbotics. To generate the triangle wave we need to use the Schmitt Trigger circuit (also called a comparator with hysteresis) that act as ON and OFF switch to the Integrator circuit input. The integrator uses the R5 and C2 to produce the necessary triangle linear ramp (up and down) on its output. As you might guess the actual frequency measured on this Line Follower Robot prototype circuit above is about 292 Hz, this is due to the electronic components tolerance value (resistors and capacitors). Therefore if you want to have the exact frequency you could put a 100K trimport in series with R5 resistors. The voltage divider R1 and R2 provide the voltage reference (DC bias voltage) to both U1A and U1B op-amps. 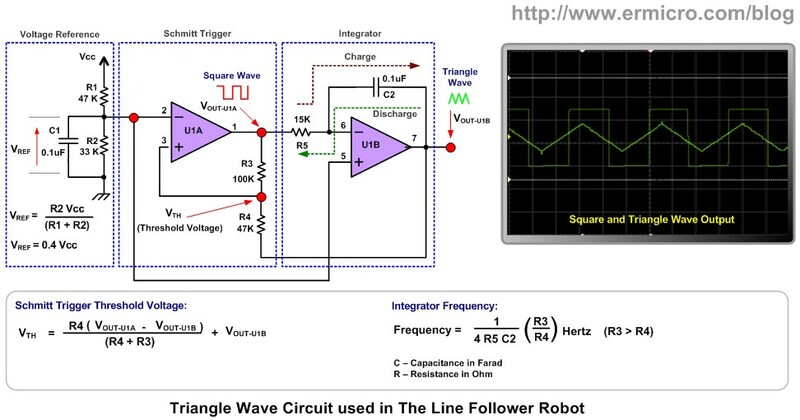 As mention above this Line Follower Robot take advantage of the photo-resistor (CdS) known as Light Dependent Resistor (LDR). The LDR will decreases its resistance in the presence of light and increase its resistance in the dark. The region under the LDR is illuminate with a high intensity blue LED, the white surface will reflect most of the light to the LDR surface while the black track line will absorb most of the light, therefore less light will reflect to the LDR surface. 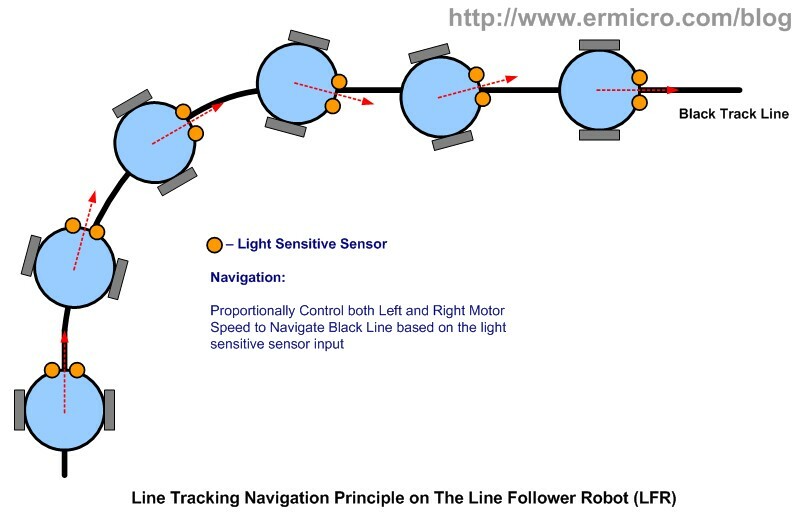 As the robot move on the black track line the LDR will continuously capture the reflected light and convert this light intensity into the corresponding voltage and feeding it to the inverting input (V-) of U1C (left sensor) and U1D (right sensor). 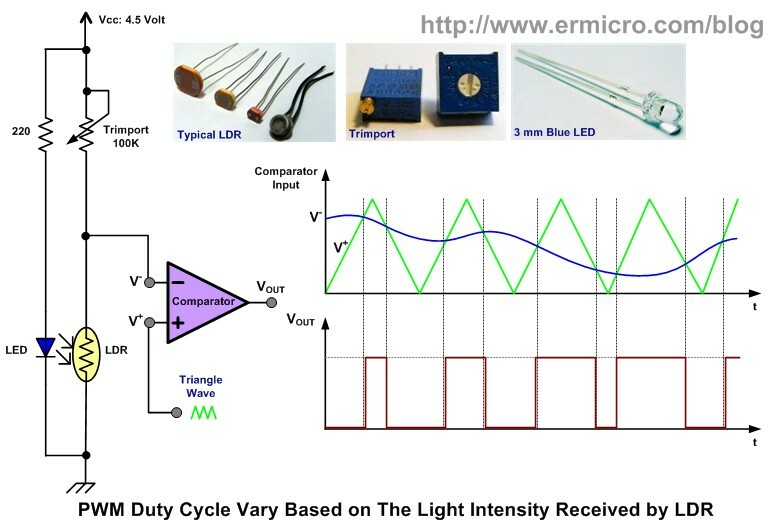 The 100K trimpot and LDR basically is the voltage divider circuit when the LDR detect the black track line it will receive less light intensity (LDR resistance increase) and the voltage (V-) will increase; this will decrease the PWM duty cycle output and as the result the geared DC motor will turn slowly or stop. When the LDR on the white surface it will receive maximum light intensity (LDR resistance decrease) and the voltage (V-) will decrease; this will increase the PWM duty cycle output and as the result the geared DC motor will turn fast. The geared DC motor driver uses the BC639 transistor and the base terminal is connected to the comparator output through the 1K resistor. The transistor is operated as a switch which turns ON and OFF the geared DC motor according to the PWM pulse current it received from the comparator. The 0.1uF capacitor across the geared DC motor’s terminal is used to reduce noise generated by the DC motor. For more information about using transistor as switch you could read Using Transistor as Switch article on this blog. As you’ve seen from the demo video above this Line Follower Robot design is capable to handle and smoothly navigate a quite complex black track line. 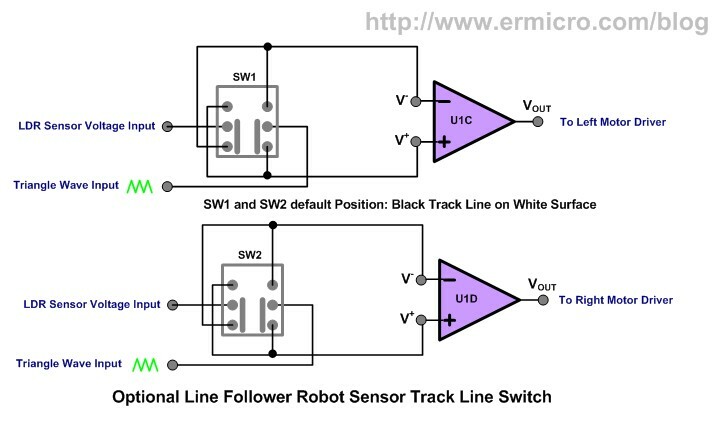 This prove that a good analog Line Follower Robot design sometimes could outperform many microcontrollers based Line Follower Robot. Building the Line Follower Robot (LFR) is one of my favorite projects as I enjoy designing and making this kind of robot, it also gives much joy and fun to your kids as well. I hope this project will give you as much joy as I did; building, watching, and playing with this analog Line Follower Robot. “You could simply exchange the comparator V+ and V- input source to make the Line Follower Robot detect the white line on the black surface instead of normal black line on the white surface”. Remember the picture on the breadboard is the “experiment circuit” and is not intended as the guidance that you have to follow. My suggestion is to test your circuit one by one, make sure the BC639 transistor pins (i.e. B,C, and E) and the LM324 pins is correct. For example your sensor LED (series with 220 Ohm resistor) should be light up as is just a simple connection between the Vcc and GND. Remember sometimes just a tiny mistake can ruin up all the circuit especially when you use a breadboard. The triangle wave should be on the positive side and the pin 8 should give you a PWM output base on the light intensity captured by the LDR sensor. I am guessing that maybe i should try other phot resistors. Do you have a number for them. Will VT34N1 ones work i think they are close to 9mm. The ones i am trying now are 4mm. The 9mm ones are 4k in bright light and 200k in dark. If not what range should i be looking for. If my motor works and i have the triangle wave but am showing no change in motor speed or direction is LDR the most likely culprit? Try to measure the voltage between the trimport and LDR, it should change according to light intensity. 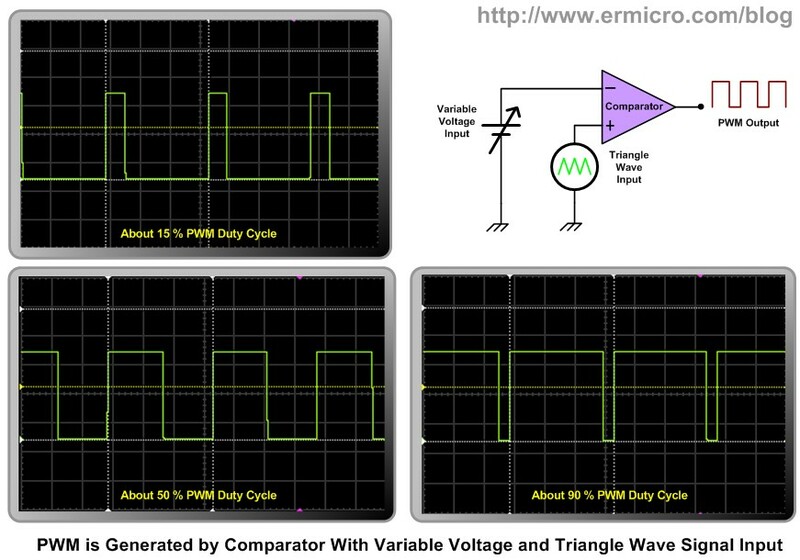 Study the picture “PWM Duty Cycle Vary Based on The Light Intensity Received by LDR” above to understand the working principal of the Voltage Control PWM. sir i have problem in transistor using switch,sir i have use TIP 122 NPN transistor connecting base terminal with 1kohm to 8 th pin of comparator ,DC motor work bt not logically it dont work according to LDR. Please read all the comments and answers above for the clue to solve your problem.